Spring is on its way, and that means you can finally get off the treadmill and start doing your runs in the great outdoors. But with the fluctuating temperature and on-and-off rain that the season brings, it’s important that you have the right clothing to support your athletic endeavors. Nothing cuts a run short like getting caught in a downpour while you’re sporting a cotton T-shirt and shorts. And it’s not much better to get out there in a fleece long-sleeve only to have the sun come out, bringing you slowly to a boil. Stay comfortable, no matter what the length or intensity of your run, with these key pieces. No amount of layering will help you if you’re out running and spring showers decide to come your way. To keep yourself cozy and dry all run long you need to invest in a shell. Look for one that goes either to or past your bum for maximum coverage. It is also wise to look for one with a hood that seals tightly around your face to keep as much rain off as possible. And bonus points if it has pockets, as you might need to store away layers that become obsolete halfway through your outing. Something along the lines of Lululemon’s pack and go pullover is great because it is wind and water resistant and made of flexible, breathable fabric. Capris are the perfect spring bottom because they walk the line between summer short shorts and winter wooly leggings. They make it easier for you to get out there even if the air might feel brisker than you’d like, and then allow you to cool down as the run goes on. Arm warmers are far more than just an ’80s fashion statement. They are superb for the fickle spring weather, because you can start out with them on and take them off once you warm up. Plus, they come in lots of fun styles and colours — so you’ll want to get out there and show them off! The majority of spring days are a little on the cool side, so wearing a T-shirt under a weather-resistant layer is the perfect combination. The fabric used in technical Ts allows sweat to escape, so it doesn’t stay trapped inside your layers, making you feel damp and uncomfortable. New Balance’s Tempo Tee, for example, has moisture-wicking fabric that pulls sweat away from the body and lets you dry more quickly. It also fits closely, but not too tightly, which makes it great for wearing under other layers. This may sound like an obvious one, but far too many people leave home in the spring thinking that because it isn’t too hot out they don’t need a hat. But that really isn’t the case. Wearing a hat with a visor keeps the sun and rain out of your eyes, which makes your run far more comfortable. And you can pair a hat with sunglasses for extra protection. 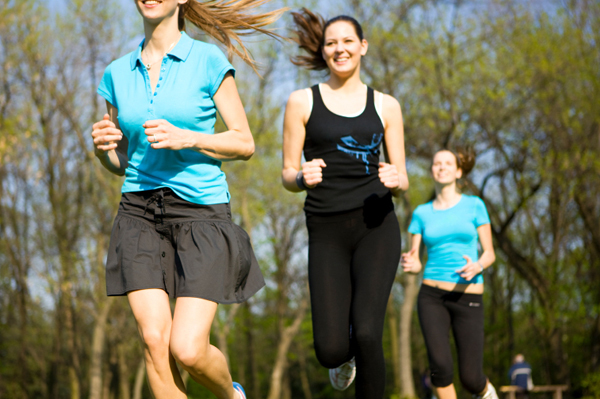 This spring, don’t let the weather dictate how much pleasure you get from your run! Invest in some of these great pieces of clothing to keep you comfortable all season long.